Convert raster to vector in batches. Support various source and target formats. Support custom page view and colors. Cloud Image to Vector Converter: Convert raster images like PNGs, BMPs and JPEGs to scalable vector graphics (SVG, PDF, DXF, EPS, PS). Input formats: PDF (Scanned PDF and Vector PDF), BMP, PNG, JPG, JPEG, GIF, TGA, PCX, TIF, TIFF, DCX, EPS, PS, ICO, MNG, PPM, PNM, PGM, PBM, PSD. Output formats: SVG, PDF, EPS, PS, DXF. 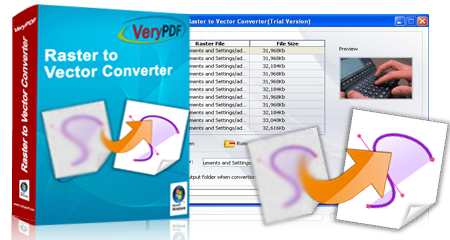 Stand-alone Raster to Vector Converter Desktop GUI and Raster to Vector Converter Command Line applications to convert bitmap images to vector images offline. Supports all functions in the online version, plus AI and DXF output. Works seamlessly with Illustrator, Corel, and others. What are the advantages of vector file? Convert Office documents (Word, Excel, and PowerPoint) to PDF and other image formats. It also provides two virtual printers for converting files among various formats. Convert images to searchable textual PDF with Optical Character Recognition. It can also convert images to editable PDF by command line.